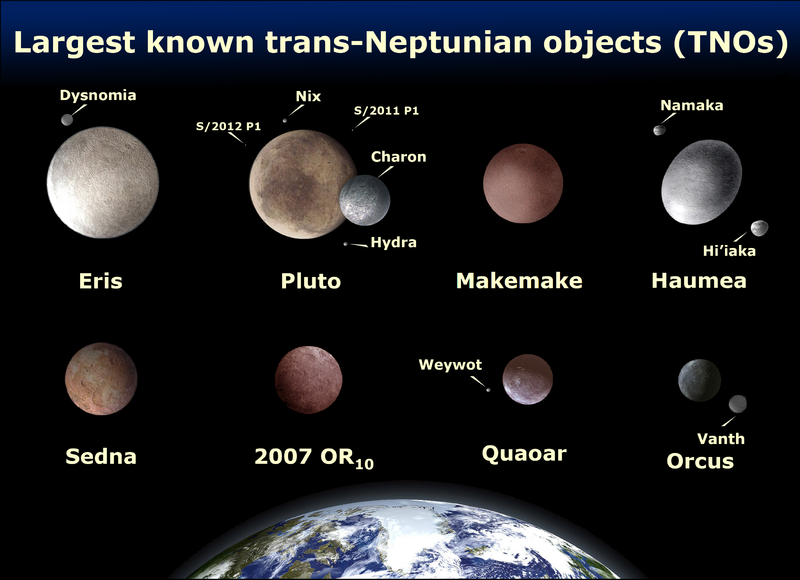 Comparison of the eight brightest TNOs: Eris, Pluto, Makemake, Haumea, Sedna, 2007 OR10, Quaoar, and Orcus. Five of these TNOs are known to have moon(s). 2007 OR10 is currently estimated to be larger than Sedna. 2002 TC302, 2002 MS4 and Salacia are, to within uncertainty, estimated to be larger than Quaoar and Orcus, but are less bright due to lower albedos. Since Quaoar and Orcus have moons, it is known that Quaoar is much more massive than Orcus. The top 4 are IAU-accepted dwarf planets while the bottom 4 are dwarf-planet candidates that are accepted as dwarf planets by several astronomers. Date Source Based on the public domain Nasa images: Image:2006-16-d-print.jpg, Image:Orcus art.png. • to share – to copy, distribute and transmit the work.